A number of years ago I decided that it was time to step up my game when it came to sleepwear. No more old mis-matched T-shirts and leggings or shorts. It was time for real pajamas. The kind that you can feel good about wearing when you’re a guest in a hotel or at someone’s house. The kind you aren’t embarrassed to be seen wearing when a neighbor drops by unexpectedly on an early Saturday morning. You’ll want to consider your fabric options for this pattern, too. Obviously, for winter—and especially for the upcoming holidays—cotton flannel is a great option and comes in lots of fun colors and patterns. 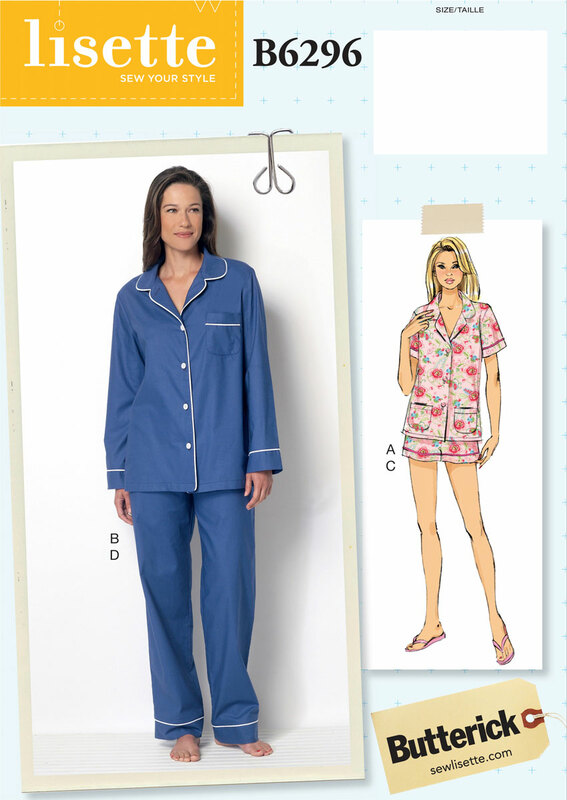 And cotton poplin or even quilting cotton will give you lots of choices for summer-weight pajamas and lots of options when it comes to prints. Cotton lawn, double gauze, and linen would feel especially nice against the skin if you want to give yourself a little luxury. I’m going to start with a really pretty Liberty of London lawn for my PJs, with sunny yellow pining. Or go all the way and sew an ultra-luxurious set in silk or silk satin! And guess what? You can also use stable knits for this pattern, if you’re so inclined. This would make the pajamas every more comfortable to wear while still looking pulled-together and elegant. Of course, you can wear the pieces as separates, too. Maybe you prefer to wear pajama pants with a cute fitted T-shirt or camisole. But what about wearing the top as clothing? I’m planning to wear my PJ top, with piping, as everyday wear, too. Have fun with this pattern, and I hope you’ll show us how it turns out in the Lisette Flickr group or on Instagram: hashtag #sewlisette and #B6296 so we can find you! I’m curious to know about the forward shoulder seam. Is it simply a design feature, or does it change the fit?